Daniel Ricciardo once again snatched victory from a capitulating Mercedes team, with the tension between Nico Rosberg and Lewis Hamilton prompting fierce accusations and a philosophical reevaluation. Before the race Rosberg was tetchy when addressing the media. The playful young man often seen juggling a soccerball at the back of the garage was gone. In his place stood a rugged, unapologetic racing driver. At the last race in Hungary the team mishandled their drivers, informing Rosberg that his teammate was going to let him through when in fact no such thing was forthcoming. It upset the German, and apparently the issue was left unchecked until the Thursday before the Belgium. Rosberg’s poor start allowed Hamilton and Sebastian Vettel to leapfrog him, with Vettel steaming through Au Rouge and fast approaching Hamilton on the Kemmel Straight. The Briton defended the inside line and Sebastian found himself wrong-footed in the braking zone and forced onto the runoff area. Rosberg inherited second place as Vettel rejoined the track, but was immediately on Hamilton’s gearbox and caught had a sneaky look coming out of Blancimont at the end of lap one. A few corners later Hamilton was again slower than the car behind him, and in a very similar approach to Le Combes had to cover off the inside line. Rosberg was smoother through the corner than his countryman had been, but was squeezed between his teammate and the track limits on the exit of the right hander, his front endplate snagging Hamilton’s rear left tyre and instantaneously deflating it. Lewis’ race was ruined. 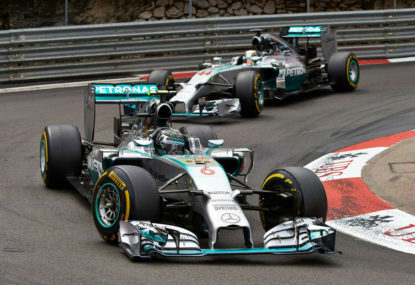 Rosberg was forced to pit early for a new nose without any chance of making the optimal two-stop strategy work. Niki Lauda was especially furious that the incident happened on the second lap of the race. Following a private debriefing afterwards, Mercedes Executive Director Toto Wolff informed the press that team orders were on the table as a possible solution to the stalemate. I find this ridiculous, for a number of reasons. Firstly, one of their drivers has already disobeyed team instructions (hint: it wasn’t Nico) and their failure to diffuse the situation contributed to the tension ahead of this race. Secondly, the incident between Rosberg and Hamilton would not have been avoided if team orders were in place. The only appropriate instruction, i.e. don’t take each other out, has been in effect all season long. Nico’s frustration at the perceived lack of assistance from Lewis and the team in Hungary only contributed to his elbows-out, argy-bargy approach to Le Combes. Ultimately Nico was to blame for the accident. It was clumsy, there’s no denying it. Slamming your front wing into someone’s wheel is no guarantee that you’ll do any damage to them, and it’s a sure bet that your own nose will require attention. Furthermore, Fernando Alonso misjudged Sebastian Vettel’s approach to the hairpin and tagged his rear tyre, only for both cars to continue battling until the finish line. Having recovered well to finish second, Nico shared the podium with the future stars of Formula One, Daniel Ricciardo and Finn Valterri Bottas. While the other drivers were smiling, Nico looked sullen and stood hand-on-hip through the procession, desperately wanting it all to be over. The shameful scenes that plagued the sport for most of last year returned, as those assembled (largely Brits taking advantage of a long weekend to trip over to Belgium) voiced their disapproval, seemingly anguished by Rosberg’s very existence. Eddie Jordan, who was conducting the post-race podium interviews, intervened and scolded the crowd for their immaturity. Being told off by Eddie Jordan must be like being yelled at by your Dad, but at least he showed some authority, which is more than can be said about most of last year’s interviewers. Unfortunately one of the Mercedes drivers has time and time again caused tension in the team, accusing the other one of cheating on multiple occasions (without proof, I might add), forcing a wedge between his teammate and the engineers, and playing mind games within the team and in the media. Yet somehow the guy who misjudged one corner by only a few inches is the one getting booed.